The Philippines is one of the most disaster-prone countries in the world. These disasters range from earthquakes to landslide and floods. This has taken a severe toll on lives, property and even the economy. These disasters are largely attributed to the country’s geographical position being in the Pacific Ring of Fire where seismic and volcanic events are common and also by being in the typhoon belt where the country is subject to an average of 20 tropical cyclones annually. The only way to address this is through preparation, training, planning and making these communities disaster and climate change resilient. Information is crucial in this aspect since it is the frontline in disaster awareness when preparations can be made. Also, information is critical to response, relief, and recovery during after disasters. This information must be timely and exact and this is where the use of technology can be harnessed. 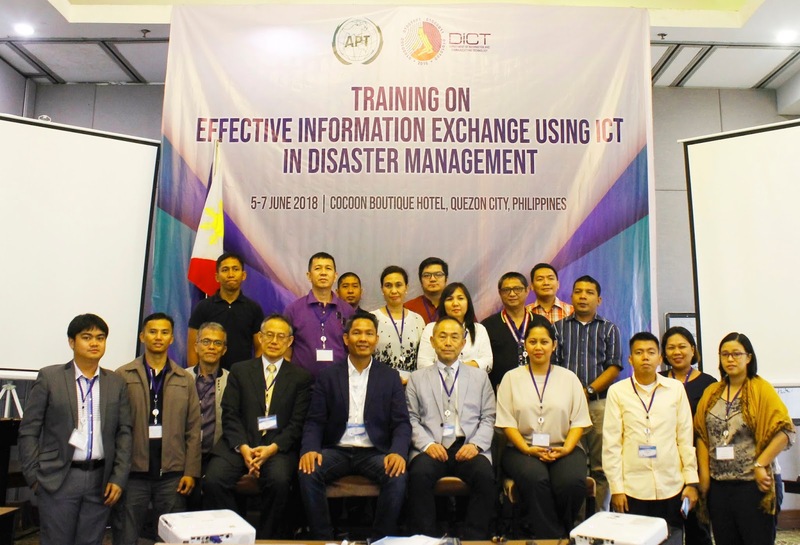 The Department of Information and Communications Technology (DICT) is at the forefront in utilizing Information and Communication Technology (ICT) in meeting the challenges of disasters. The DICT conducted a three-day training on the effective use of ICT in information dissemination and exchange for use in disaster management. This was held from June 5 – 7, 2018 at the Cocoon Boutique Hotel in Quezon City. The aim is to give the participants understanding and conceptual information and theoretical principles of Effective Information Exchange using ICT in Disaster Management, identify effective Telecommunication & ICT Solutions for Disaster Prevention, comprehend Early Warning Broadcast System (EWBS) Protocols, and recognize the Role of Broadcasters in the Event of Disasters. The participants in the training were from the National Disaster Risk Reduction and Management Council (NDRRMC), the DICT, Cybercrime Investigation and Coordinating Center (CICC). The Kapisanan ng mga Brodkaster ng Pilipinas (KBP), Presidential Communications Operations Office (PCOO), People’s Television Network (PTV 4), and other concerned national government agencies. The resource speakers were Mr. Masato Tamura, Senior Director, and Mr. Masakazu Naitu, Director of Japan Telecommunications Engineering and Consulting Service (JTEC), Mr. Seiji Ida, Manager of Japan Radio Co., Ltd. (JRC), and Mr. Haruo Saito, Senior Producer of NHK International, Inc.